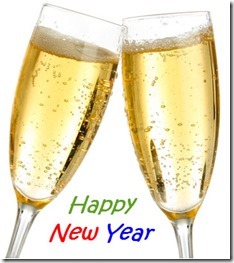 Picasa: 2015 Year in Review–Good News/Bad News – Learn Picasa and Google Photos! I wonder if you can help me with a Photo Stream problem. I got a new Win10 computer and successfully migrated my Picasa photo library. But, Photo Stream no longer works. The folder is visible in Picasa but new Photos (such as from iPhone) do not appear. In iCloud Settings Photos is checked, and in Photo Options My Photo Stream is checked. I’m really not sure. I have a screenshot of my setup. Any possibility it is using the wrong account? The ‘download to picasa’ option in Picasa Web has stopped working, and the ‘download all’ option in Google Photos downloads a zip folder which defeats my Sister’s capability to see them on her computer. With ‘download to Picasa’ they appeared when opening Picasa on her computer, with ‘download all’ they require an extra step to extract them to a folder and this is too much for her to manage. Do you know if there is a technical reason why the photos need to be downloaded in a zipp’d folder instead of a folder with the photos in it, there is no bandwidth saving as jpegs are already 100% compressed. I am aware of the File;Import from Google Photos option, but that doesn’t work with shared albums. By the way, she lives in the US while I live in the UK and it’s extremely difficult to try and talk her how to extract, or even find her Download folder. She stresses out very quickly. I also had that problem of Picasa not finding my online albums, but I just tried it again this morning and it is fixed!! I’d be interested to hear if it is fixed for you?? I don’t know what happened, but I’ll take it! One reason for the zip file … the Download to Picasa only gets pictures that are not already on your hard drive – the Download all is a complete copy of all pictures in the zip file. I love how Google Photos made it possible for me to do a year review for my blog. All my photos were laid out by date and I chose one or two photos for each month. This was my first “year in review” as it was so easy! I did not like that my GP desktop loader automatically loaded the uncropped, unfinished photos to Google Photos. I had to delete all of them in GP and then upload the finished photos from Picasa……and was limited to the lower pixels. It seems to be too much trouble to ask for the resizing but may try that. Just uninstalled the GP uploader from my desktop. Yes. Thanks and I had seen that great clip. I am using Open Live Writer with Blogger and the OLW photo options are from one’s stored computer files or using a web address for internet stored photos….which I could not do. I created a collection on GP and downloaded it to my laptop…then I could insert the photos from my hard drive. And I did not know I could turn the Google photo uploader on and off. Could not find the setting to do this. Thanks. Met you at the Q Yacht Club. Happy New Year and many thanks for the articles and your year-end recap. I continue to be not particularly thrilled with Google Photos – too many missing features, and just not designed for those that don’t use smartphone or tablet for taking photos on a regular basis. 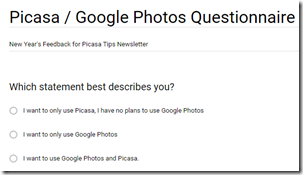 I’m using Google Photos with Picasa and trying to be patient – hoping for needed changes. I just haven’t been able to muster enough energy to look into other photo editing and management systems. Perhaps Pixlr with Flickr. Maybe a good New Year’s resolution. I agree Google has Picasa way down on the list to do something with – my guess its only a matter of time that it will be eliminated totally. Base my opinion on the fact they have done this with successful products before,i.e. Google Reader to name one. Thanks for the survey – and asking our opinion. Evelyn, since you use Picasa->Google Photos … I’m wondering if you’re having the same issue I am? A week or so ago, Picasa stopped being able to upload to an existing album. I can upload to a new album, but I get an error that Picasa cannot download list of existing albums. You? This is happening on multiple computers with different Windows OS – the Mac version still works fine. It had been month or so ago since I uploaded any Picasa photos. I gave it a try just now, and no problems at all. Uploaded photo from Picasa to the album I chose promptly and displays properly. I am using Windows 7 and Google Chrome. Wonder if your Picasa could be corrupted. Kind of a basic fix to things maybe try: clear the browser cache, log-out of Google, restart computer and sign-in to Google. Hope this isn’t one of those problems that goes on and on. Thanks Evelyn, that’s good to hear, so it’s something with me – not with Google. However, I have the same problem with 3 different computers, Windows 10 and Windows 8, so I don’t think it’s a computer installation issue. That leaves me with an account issue. Anyway, thanks for giving me a good piece of the puzzle. Hi. 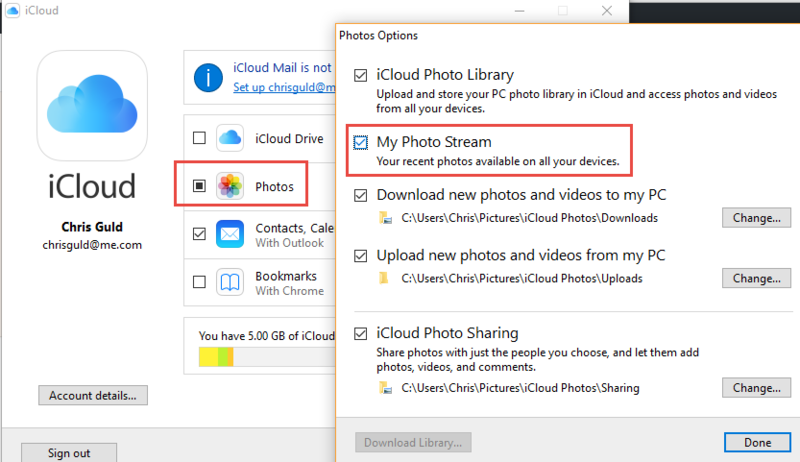 Exactly what is the best step by step process to use to transfer the photos from my iPhone (6s) to my Windows 7 PC please? I’ve tried but they don’t transfer successfully. I have both iCloud Photo Library and Photo Stream turned ON. Where on my PC is best to keep them and to edit them? My Pictures? I also have Picassa and Google Photos. I still seem to have DropBox and Copy.com!! What of these can I safely remove without losing photos? It feels such a mess!!! I have photos all over the place…..appearing in different folders!! I bought a instruction book for Picasa many years ago when I was running Windows XP. Example, how to order prints, and new Picasa does not have the button to click to order prints. .I ordered prints often, and now am just sick that it is no longer available in this new version. I would be happy to buy a manual of instructions that are up-dated to work on the updated Picasa. The button may be missing, but Order Prints is still there on the File menu. The current version of the book (available in the right sidebar on this site) is up-to-date with Picasa 3.9, but before Google Photos. Google Photos only changes the behavior of the Upload button in Picasa. On page 50 of the current book, the directions for File-Order Prints is current. Also on page 13 are instructions for getting your buttons back at the bottom. I love Google Photos as well but I do like to have my photos on my laptop as well.. I understand. At the very least we need a copy of our best pictures on our computers or some local drive – not just in the cloud. I love Google photos. I uploaded all the photos from my computer, iPhone and iPad to Google Photos and can view them anytime. Cool. Once you get accustomed to having all your pictures available on any device, you can’t live without it!